The former Chesterfield manager Tony McShane passed away in Plymouth on Christmas Eve, 2012. When Chesterfield came calling McShane was working as an FA coach in Cornwall, while running his own grocery business although he reportedly turned down a job coaching in Nigeria to come here. Much was made of McShane’s demand to have “full powers of management” seceded to him. Perhaps Tony McShane was the first Chesterfield manager to pick his team without the board’s input. He inherited a team that had just finished in its lowest-ever position and little cash was provided to improve it. Typical of the restrictions that McShane laboured under is the fact that, for the early part of his reign, he was forced to sign unmarried players only, since the club lacked houses to accommodate families. John Meredith was an early import, and he introduced a more competitive approach to training, but his most significant early move was to organise youth trials and set up a proper apprenticeship scheme. The likes of John Beresford and Tony Hallam were early products of this system. The lack of money was a constant handicap. McShane negotiated a deal to sign Ron Davies, a blond centre-forward from Chester for a £3,000 fee but the club could not find the money. Luton nipped in and sold him on for £35,000 in 1963; Davies went on to score 134 goals in division one and play 29 times for Wales. There was an air of depression about the club in the early1960s that McShane was unable to lift. In truth, Mourinho would have struggled to lift the spirits of that side. Despite the occasional promising start the team did not finish above twelfth in his time here, since too many players understood that they didn't have to make an effort to get into the team. The effort put in by the likes of Albert Holmes and Albert Phelan was negated by players who came on a free, picked up a wage and were moved on, usually to the non-league game, a year later. McShane’s inability to motivate his charges appeared real enough, and his attempts to get more out of them by playing them out of their established positions assumed an almost legendary, comic status among supporters. The 1963-4 squad take a break from training at Pitt Street. Tony McShane is second from the left. McShane played the old “I’ll drop the lot of you” card in December 1965 after a lack of effort from senior pros, threatening to bring inthe reserves, although his position was somewhat weakened by the fact that the reserves had won just two of their nineteen games thus far! Needless to say, this outburst had no effect on players who knew they were safe until the end of the season. Despite the manager’s apparent failings, though, the board should be apportioned a lot of the blame for the club becoming a traditional fourth division side. After all, McShane hadn’t even signed as a player for Plymouth when the rot began. 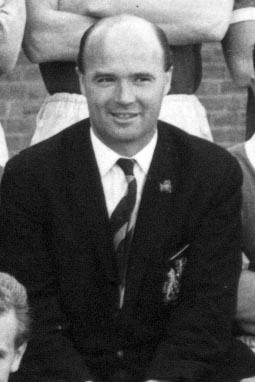 His efforts to bring unknowns through were often successful (the majority of the 1969-70 championship team were signed by McShane) and it was hardly his fault that the only experienced players he could sign were those that were largely unemployable elsewhere and couldn’t be bothered, here. It wasn’t until half of the board resigned to make way for new blood in 1966 that a speck of light was seen at the end of a long tunnel. Any improvement this brought did not come in time to save McShane. He was reported to have resigned in July 1967 with ten months remaining on his contract. Tony McShane returned to the Plymouth area and became a good golfer, writing an occasional column on the sport for the Plymouth Independent newspaper. He also managed an Oxfam shop. His experience of Saltergate life in the 1960s wasn’t entirely wasted, then.